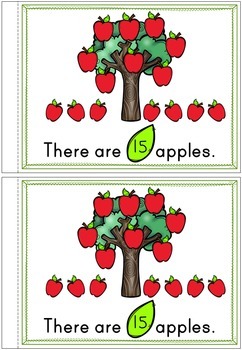 Numbers 11 - 20, Emergent Reader Counting Apples! 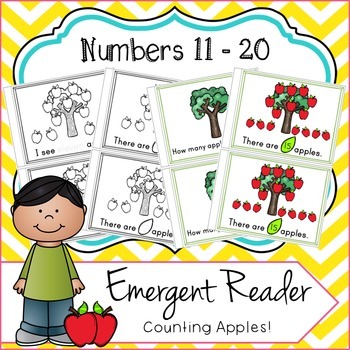 Emergent Reader Counting Apples (Numbers 11 - 20), 50 pages, color and black & white! Black & White: Count the apples and colour them in. Trace the word and the numeral. Colour: Count the apples. Read the words and the numerals. Perfect for reading to the class or placing in your book corner for independent reading. 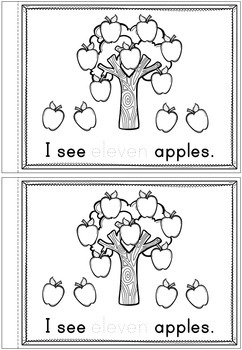 Sight words focused on: I, see, there, are and number words 11 - 20. - Let's count the apples! - How many apples will I see? - I see ____ apples. 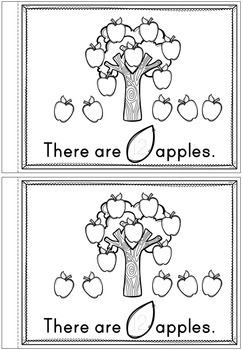 - There are ____ apples. - There are lots of apples! You might also be interested in my Emergent Reader Numbers 1 - 10!